After placing 1st in three out of four meets this season, Track and Field hope to secure a fourth at Thursday's meet in Flowery Branch. On Thursday, March 16th, RMA Track and Field traveled to Franklin Couty High School to compete against 11 of the best track programs in Northeast Georgia: Elbert Co; Stephens Co; Franklin Co; Madison Co; Rabun Co; Hart Co; Washington Wilkes; to mention a few. After a hectic week for the cadets: a meet at North Oconee on Tuesday the 13th and a rigorous field day on Thursday the 16th, the cadets dug deep and found a way to win the John Scott Hartness Invitational Meet. RMA scored 162 points to runner-up Elbert County’s 105 to win the meet. Key performances would be Jabarri DePass, whose best high jump prior to the meet was 5ft 10in, but reached 6ft 4in on Friday night to win the event; Harry Kim, who came in 2nd for discus with a throw of 128 feet 11in. Charles Dimnwaobi remained on top form, placing 1st in the 100m and 200m, and Issac Teasley won the triple jump and 400m. James Seymour won the 800m with a time of 2:03 and was on the winning 4x4 team; EB and Preston Levine both had great performances in the shot put and pole vault respectively. 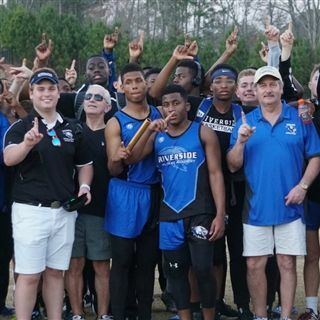 The Eagles travel to Flowery Branch on Thursday night for the Hall County Championship meet. Gainesville has a great team, energized by the return of some basketball players from their run in the state tournament, but we outfought them at East Jackson two weeks ago 95.5 to 94. RMA would love to have some of you come out and see what is shaping up to be a pretty good track team. Go Eagles!